Authorities of the Polytechnic, Ibadan, have announced the closure of the institution and the suspension of the Student Union Government (SUG) following the violence that erupted in the school earlier today. Report of the closure was contained in a release signed by the institution's registrar, Mrs. Modupe Fawale which was made available to journalists in Ibadan, the Oyo State capital. In her word, Fawale said the suspension became necessary as the Student Union body had failed to obey and follow the rules guiding its activities on campus. 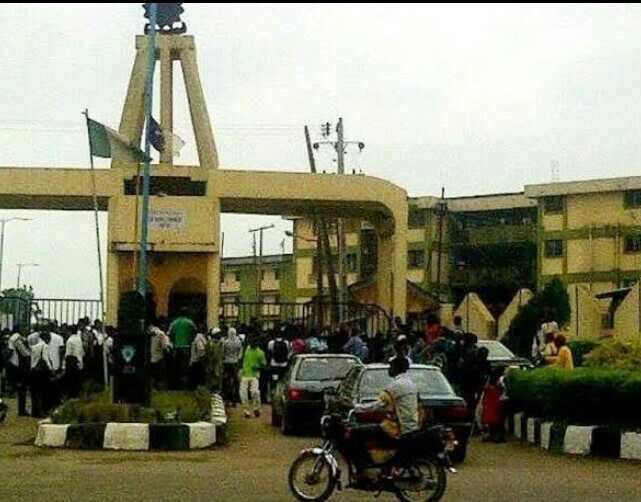 The violence which started on this morning saw students of the Polytechnic Ibadan, barricaded the main entrance and other gates leading to the institution in protest over the stabbing of one of their colleagues and injuring of another during a female sports competition, (SUG Cup). The institution registrar noted that the Authority of The Polytechnic, Ibadan have closed the institution and the students are to proceed on mid semester break immediately. "The students are to resume for studies on Wednesday 10th of April, and all students are to vacate the hall of residence immediately". Fawale reiterated that the police have been invited for smooth vacation of the students from the institution so as to prevent breach of peace. 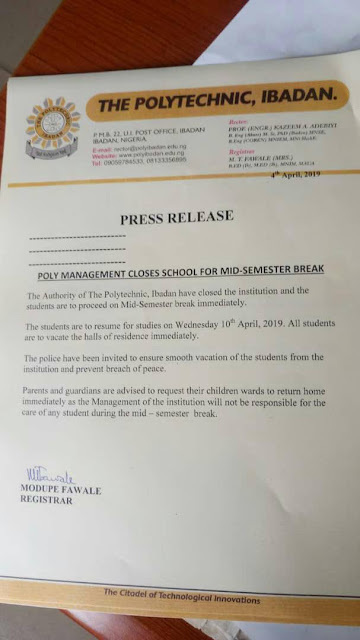 "Parents and guidance are advised to request their children and wards to return home immediately as the management of the institution will not be responsible for the care of any student during the mid semester break". Meanwhile, the Oyo State Police Public Relation Officer Oyo State Command, SP Olugbenga Fadeyi said that the police is on top of the situation and investigation is ongoing.